Scholarship on Chinese foodways has grown at a steady rate over the last few decades, following the publication of two landmark works that outlined the importance of food in Chinese political, cultural, and social organization. 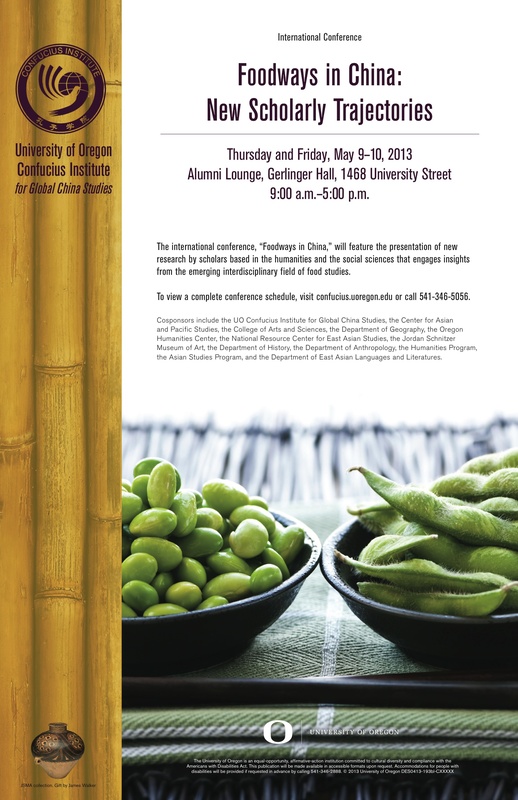 The international conference ‘Foodways in China’ will provide a venue to discuss research that has augmented the largely anthropological and historical contributions of those earlier works, and new work by scholars based in the Humanities and Social Sciences that engages insights from the emerging interdisciplinary field of Food Studies. Co-sponsors include the UO Confucius Institute for Global China Studies, the Center for Asian and Pacific Studies, the College of Arts and Sciences, the Department of Geography, the Oregon Humanities Center, the National Resource Center for East Asian Studies, the Jordan Schnitzer Museum of Art, the Department of History, the Department of Anthropology, the Humanities Program, the Asian Studies Program, and the Department of East Asian Languages and Literatures.